Bringing the very best of British personal development & therapy training to individuals and organisations in India. So many training companies offer great claims and hype, certifications and wonder…only to deliver the same old powerpoint & scripted presentations. With the international reputation of Nick Kemp you can be certain of quality guaranteed. No powerpoint, no hype and no nonsense, just pure intelligent training for the modern thinking audience. With charismatic presentation styles, client demonstrations, humour and style, Nick is sure to thrill the audience. For 2015, Nick Kemp will be offering his unique trainings only in Goa, India. Fees are reasonable & places are limited... early booking is advised by sending a deposit. ﻿Pay a deposit to book your seat now. Nick Kemp is one of the most experienced NLP Trainers in the world, having taught at some of the best and most respected NLP organisations such as NLP Comprehensive run by Steve & Connirae Andreas. He is recommended by Steve Andreas for his unique and innovative work. Take advantage of this rare opportunity to work with Nick Kemp here in India, now! ClassNLP is sponsoring Nicks training in Goa, as it really is a rare opportunity to learn from such an experienced NLP Therapists in India itself. 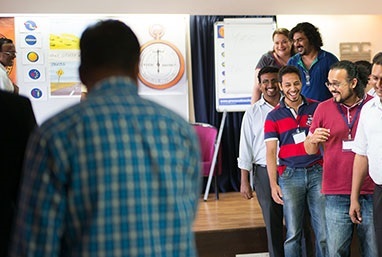 Provocative Change Works - Full Practitioner training in India! ﻿Nick Kemp﻿ will be conducting a FULL Provocative Change Works, PCW, practitioner training in Goa. Dates are tentatively around September 2015. The PCW Practitioner teaches the three key elements of the PCW so you can apply these skills in real life contexts to produce measurable and productive results. There are 3 levels to this training and all 3 levels will be taught in Goa. Participants can attend the parts individually or altogether as one complete PCW Practitioner course. Provoking new behavioursby adopting specific stances that stimulate noticeable changes in thinking and feeling. Exploring the client's internal metaphorical mapsto stimulate new outcomes. Time-framing change within real world situations. This produces an ecologically sound process for a better quality of life and improved sense of well-being. "I have found this combination to produce the fastest, most successful and lasting results when working with clients." - Nick Kemp. This is an overview of the tools available in the PCW model. You begin to explore the power and possibilities of adopting the PCW provocative stances. You learn how to get into the frame of communicating conversationally "as if talking to an old friend" while remaining in a resourceful state that will assist in client change. This level 1 training begins to explore how to use hypnosis in client sessions and techniques to change unhelpful internal dialogue providing new possibilities for the client. This module focuses on becoming an effective practitioner with an ability to use these tools with ease. We concentrate on further developing the PCW tool kit and explore the provocative stances in more depth. We also discover how to identify and challenge the metaphors that have created the problem state. By doing this you also learn how to create a useful future feedback loop for the client by working in "the here and now". This is done in an improvised manner with exquisite state control allowing the client new ways of thinking. In level two we also learn how to identify the client's internal map through information elicitation and crucially how to challenge and offer new possibilities of behaviour. This module focuses on being able to demonstrate a full understanding of the PCW process with fluidity and elegance. By the end of this module you will be able to conduct a live client session in which you clearly identify the use of stances, elicit and challenge metaphors, identify and use language patterns/hypnosis tools and work in an improvised manner.